Sorbus danubialis are shrubs and small trees up to 10 m tall. Thus, according to the forestry laws it is considered to be a tree. They are found growing in shrubland, shrub forest, open forest and rocky areas (IUCN 2017). 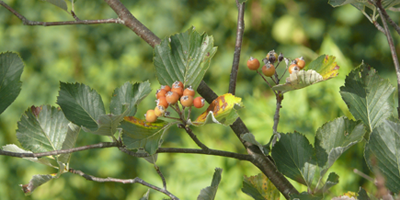 Its leaves are thick, rigid and the lower parts are greyish and downy. The dark-red fruits of this species is a food resource for grazing animals and wildlife, but it was also used as a food resource in traditional farming. The small individuals of this species that are not easily recognizable are victims of shrub clearance and wood harvesting, even though that the species is protected. Loggers do not necessary recognize this species, thus without individual protection and marking these individuals could be lost. Cut individuals regenerate reasonably well from roots and trunks; however, scion shoots are eaten by overpopulated game. Only one Sorbus danubialis remained in the project site of Esztergom (Kis-Strázsa-hill), however its range used to be much larger in the area. Therefore, our goal is to reintroduce this species by planting it in different vegetation communities of the project site (in the edges of the following forest parcels: 404, 406, 407, and 409-413). Subspecies will be carefully selected according to the local environmental conditions.